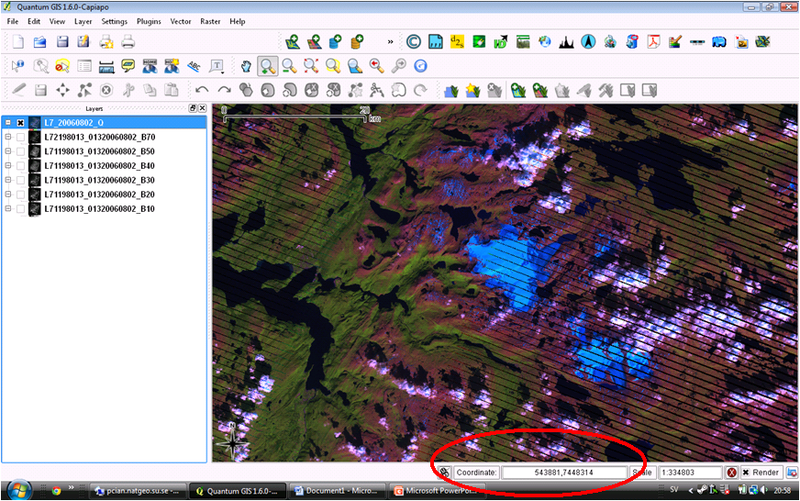 Here I will give a basic work flow for visualizing Landsat-7 ETM+ image data, from the USGS, in QGIS. 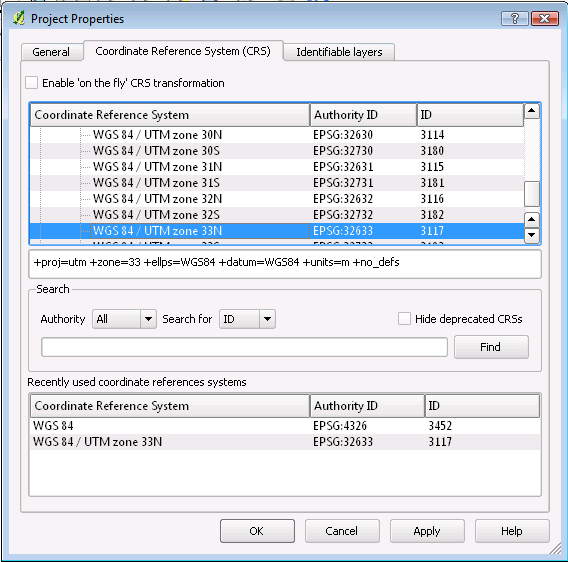 The version of QGIS this is based on is the Windows v. 1.6.0 Capiapo installation. The data are a Landsat-7 ETM+ image dataset, downloaded from the United States Geological Survey using their GLOVIS service. The images are GeoTiff format with metadata (MTL file). Plugins> Manage Plugins> (Check the boxes to select plugins or use Select All). You may wish to extend the range of available plugins using the Add 3rd Party Repositories under the Repositories tab. Python plugins are accessed through the Fetch Python Plugins of the Plugins menu. Settings>Options>General> and clicking the Override System Locale, then choosing en_us from the drop down menu. I had to restart the program for this to work. This will load the selected GeoTiffs as separate layers. This of course can be useful, not least for raster calculator operations. You can move layers up or down the layer list in the left hand Layers workspace by clicking and dragging. Turn layers on or off by clicking on the check-box to the left of the layer name. To apply contrast enhancements, set the minimum and/or maximum display values or change to a pseudocolour visualization, double click the layer name. These settings are found under the Symbology menu in the Layer Properties window that appears. Transparency, raster histogram, zoom pyramids, metadata and other information and settings can all be accessed from the Layer Properties window. This launches a somewhat enigmatic window (see below) which allows us to load multiple bands or files and save them as a combined file (multi-band or multi-spectral image). Select the input image layers using the Input Files>Select button. Assign a filename for the output file with the Outputfile>Select button. 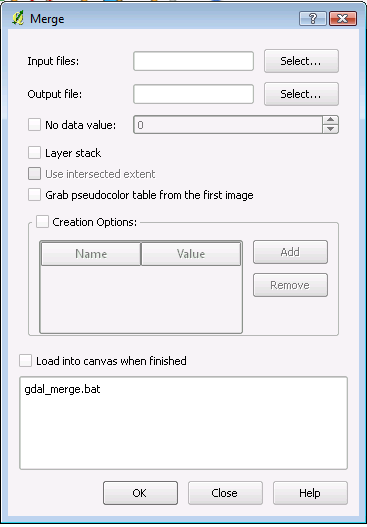 Click the Layer Stack box to create our stack of image bands and execute the process using OK. To choose which layers should be displayed in the RGB composite double click on the Layer name in the Layers workspace. Here you can also apply stretches and perform some basic image processing functions. You may have noticed that the coordinate/projection information is shown in the bottom right of the QGIS GUI (see below). You may also have found that the scale bar in the top left of the workspace shows a strange valuein units of degrees. This tells us that the coordinates in our original data have been imported but that QGIS has not recognized the coordinate system metadata. This is easily remedied. Settings>Project Properties (you may then have to click on the CRS tab, it may be defaulted). Here we can change to the correct projection: in my case it was WGS 84/UTM 33N. Now you are ready to perform your image analysis or mapping! This I’ll discuss at a later date. This entry was posted in GIS, Misc. Information, Remote Sensing and tagged GIS, QGIS, software. Bookmark the permalink.